Daily Warm Ups for Bass Guitar. Bass Guitar Method for developing a dedicated daily practice routine utilising scales, modes & arpeggios. One of the most important aspects of learning any instrument is being able to set aside time to practice. One of the most important aspects of learning any instrument is being able to set aside time to practice. Even if you have only 30 min per day, Organising your time and having the dedication to follow through with your plan is the key. 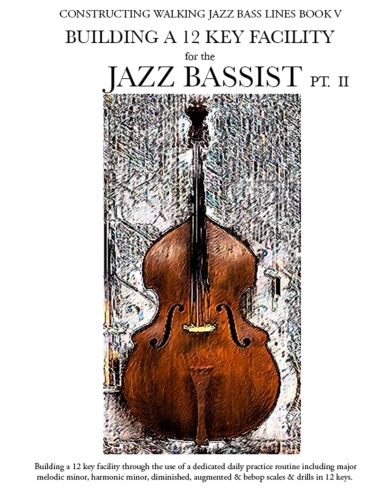 All daily warm up exercises in this book are given in bass tab and bass clef enabling bass players of all levels and musical backgrounds to have access to musical exercises. The exercises are designed to build instrumental facility and musicianship. Have the dedication to practice the exercises slowly, working on good time, tone and intonation. As a wise instructor once said to me ” there’s no magic powder “. Great players worked hard to get there, if it is your wish and your intention, you can get there too. All exercises are provided in 12 keys. For the advanced student practice the book in 12 keys, for the beginning to intermediate student practice the exercises in one key to gain familiarity with the instrument. When the exercises become comfortable move to another key until all keys are comfortable. Scale studies are designed to help the bassist to learn the fingerboard while building dexterity, flexibilty, stamina as well as building muscle memory and training the ear. The exercises in this book are practiced by professional musicians of all backgrounds , from rock to jazz to classiscal musicians. Building a 12 key Facility for the Jazz Bassist Pt. II – Methods for practicing scales, modes & arpeggios.